Microbial proteins, such as fungal biomass produced on low-cost feedstock, have gained significant attention as feed ingredients due to cost effectiveness and long-term sustainability. Fungal process is a low-cost and simple process for animal feed production, as fungi are known to grow extensively on diverse organic feedstocks under optimal conditions. Hawaii produces a large quantity of fruit and food/agri by-products and waste products that may have the potential to be upgraded into protein enriched value-added products. The ongoing CTSA-funded project “Utilization of local agri-processing by-products to produce fungal protein for aquatic feed production” is investigating this potential in products including molasses, cassava, papaya waste, and microbrewery waste. 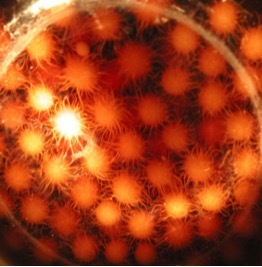 The Year 1 objectives of this project were to maximize the yield of edible fungus, Rhizopus oligosporus, on molasses, damaged papaya and taro wastes, develop a cost effective fungal biomass production process, characterize the nutritional quality of fungal biomass, and formulate test diets with the fungal protein for tilapia or shrimp. Filamentous fungi R. oligosporus is an ideal organism for animal feed applications due to its edible nature. American Type Culture Collection (ATCC) classifies the fungi as Biosafety Level I (BSL-1) organism, which is not known to cause any disease in humans and not associated with production of any harmful metabolites (Jennesen et al., 2005). R. oligosporus has been grown on corn wet milling wastewater streams (Jasti et al., 2006) and sugarcane vinasse (Nitayavardhana et al., 2013). R. oligosporus has crude protein content of 40-50% (dry weight) which is compatible with soybean meal (containing 48.1% crude protein). The research team, led by Dr. Samir Khanal at the University of Hawaii at Manoa (UHM) and Dr. Zhi Yong Ju at the Oceanic Institute of Hawaii Pacific University (OI), initiated the two-year project in November 2016. The UH team first acquired and then characterized molasses from HC&S Maui, which contained total sugar of 49%. Upon a review of existing literature, it was determined that the molasses needed acid hydrolysis pretreatment prior to fungal fermentation. This involved a 20-fold crude molasses dilution and addition of 0.2% sulfuric acid with heat treatment of 121oC for 30 minutes. Utilizing these innovative methods, researchers achieved fungal growth with molasses media. In order to test out the viability of commercially available molasses, both small batch and bench-scale studies were conducted. Initial testing using a 2.5L bubble column bioreactor with a 3-day growth cycle resulted in 10.4g of dry biomass, and a 2-day growth cycle resulted in 10.2g of dry biomass, which showed no significant difference in biomass production. Subsequently, a 20L bioreactor was setup to scale up the process and results showed that a 3-day cycle has a higher yield when compared with a 2-day cycle in the 20L bioreactor (3 day: 48.25g dry weight, 2 day: 8.65g). A test sample (~5kg) of the freeze-dried biomass product was provided to OI for nutritional analysis and a feeding trial. The OI team established a nutritional profile of R. oligosporus fungal biomass by determining the proximate contents and amino acid and fatty acid profiles of the sample provided by UH. The R. oligosporus sample was found to have around 42% crude protein, 6.4% crude lipid, and 15.3% ash. This indicated that the fungal sample had a high protein content after fungal fermentation. Further analysis found that the fungal biomass is rich in contents of essential amino acids, accounting for >50% of the total amino acids; in particular, the levels of lysine and methionine were high with 8.6% and 2.5% (dry wt.) of total amino acids respectively. These results suggest that R. oligosporus fungal biomass is a valuable protein feed ingredient for replacement of fishmeal in aquafeeds. OI is currently preparing a shrimp feeding trial using the biomass as an ingredient, and will run additional digestibility and feeding trials during Year 2. 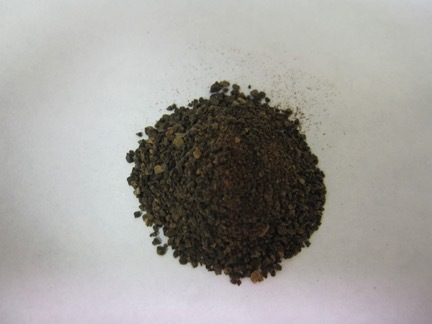 In consideration of the large amount of papaya waste product available in Hawaii, the UH team also assessed the ability of R. oligosporus to utilize nutrients in damaged rainbow papaya and seeds obtained from a farm on Oahu. The experiment found that dry fungal biomass contained a high protein concentration of 47.8%, while the effluent analysis showed a 64% reduction in glucose and no change in fructose concentration. This data indicates that papaya juice waste can be successfully utilized as substrate for R. oligosporus growth. Researchers are currently investigating the potential to also use local cassava and brewery waste as a substrate, and initial results have been positive and will be discussed in detail at the completion of Year 2. Year 2 objectives are now underway at UH and OI, and will be reported on upon the completion of the project. The fungal fermentation process, production process, and nutritional information obtained for R. oligosporus fungal biomass during Year 1 is useful for researchers and the feed industry in the production of aquatic feeds, and can encourage the application of fungal fermentation techniques to produce valuable feed ingredients from local agricultural co-products or waste materials. If the end product proves to be commercially and economically feasible, the local production of inexpensive aquatic feed ingredients from locally-available agriculture by-products will have significant impacts on aquaculture in Hawaii by reducing the state dependency on imported aquatic feed ingredients, lowering the production costs of aquaculture, and improving the long-term sustainability of local aquaculture farming.